Caroline Wimberly at our exhibit booth. 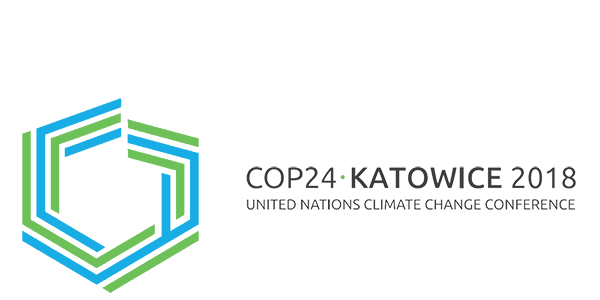 The 2018 Conference of the Parties to the United Nations Framework Convention on Climate Change (COP24 for short) took place December 3-14 in Katowice, Poland. Associate Caroline Wimberly participated in a series of events and collaborative initiatives with the goal of raising awareness of and laying the groundwork for concrete action on animal agriculture and climate change. 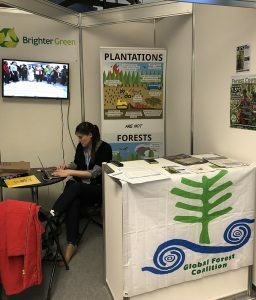 We had a shared exhibit booth with our colleagues Global Forest Coalition (GFC), sharing various materials, including our recent submissions to the Talanoa Dialogue. The Talanoa Dialogue, which was an outcome of COP23, takes stock of the collective efforts of countries in relation to progress towards the Paris Agreement goals and to inform the preparation of nationally determined contributions (NDCs). It also aims to elevate the voices of those most effected by climate change and usually with the least representation. From left to right: Steve Chiu, Buddhist Tzu Chi Foundation; Caroline Wimberly, Brighter Green; and David Pedersen, ProVeg International. Buddhist Tzu Chi Foundation organized a press conference on Monday, 3rd December in Room Katowice (Area F) where Brighter Green and ProVeg International put forward recent initiatives aligning plant-based diets and climate action. 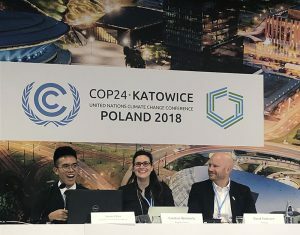 Brighter Green announced our new joint report with the Center for Biological Diversity and Farm Forward, members of the Food and Climate Alliance, “The Climate Cost of Food at COP24,” reflecting on the need for more climate-friendly food options in the very spaces climate negotiations take place. The research found that the meat-heavy menu, featuring twice as many meat-based options as plant-based ones, at COP24 could contribute more than 4,000 metric tons of greenhouse gases to the climate crisis. If international climate conferences hope to lead the way in addressing the climate crisis, organizers can’t afford to overlook the food offered at their events. A press release can be found here; a webcast of the press conference is here. More information on the materials and media coverage are available on this page. 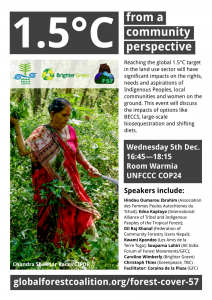 Brighter Green joined the Global Forest Coalition (GFC) and Friends of Siberian Forests (FSF) in hosting a side event called 1.5 degrees from a community perspective on Wednesday, 5th December from 16:45—18:15 in Room Warmia. 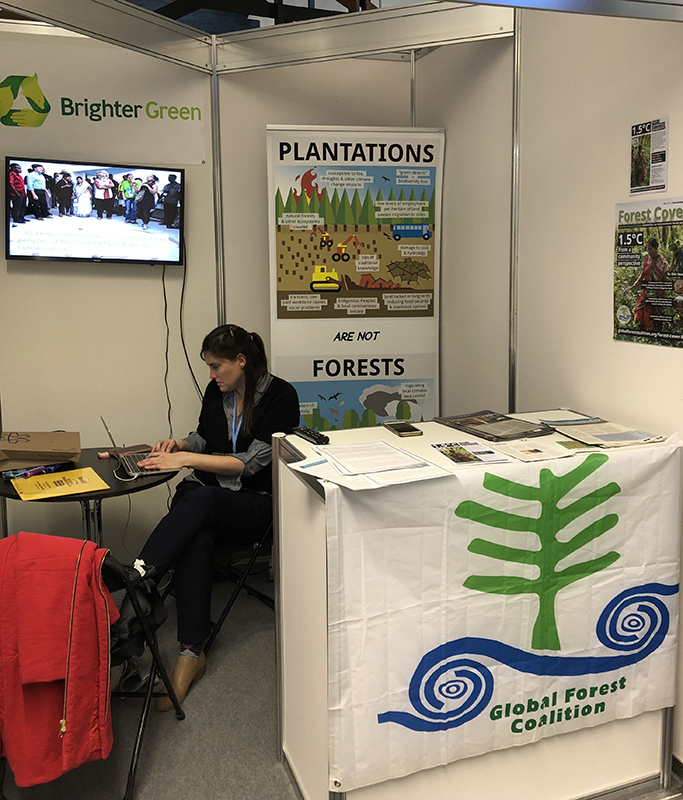 Reaching the global 1.5 degrees target in the land use sector will have significant impacts on the rights, needs and aspirations of Indigenous Peoples, local communities, and women on the ground. The event discussed the impacts of options like BECCS, large-scale biosequestration, and shifting diets. Caroline shared some points from the Incentivizing Deforestation for Livestock Products paper, co-written with GFC’s Isis Alvarez. A webcast of the event can be viewed here. 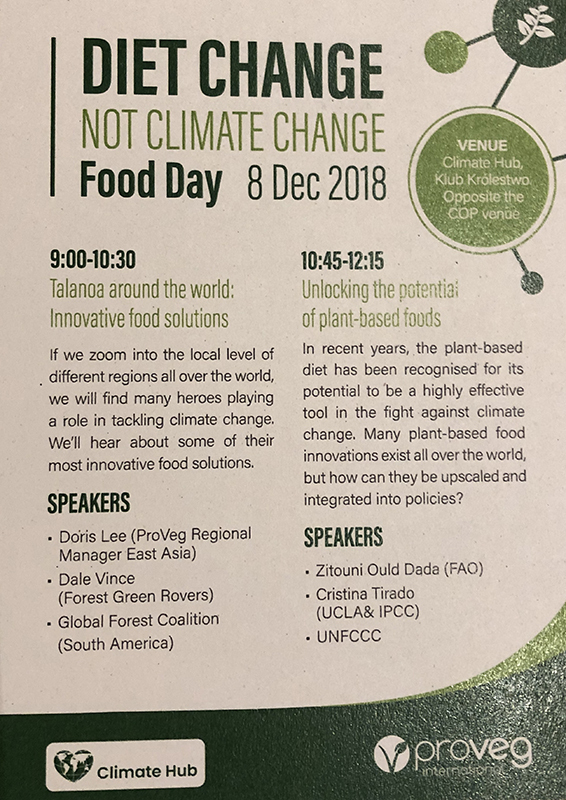 Saturday, 8th December was Food Day at the Greenpeace Climate Hub, Klub Królestwo (opposite the COP venue), which served as the civil society space. The day-long program was organized by ProVeg International. Caroline participated in the first session, “Talanoa around the world – Innovative Food Solutions” from 9:00 – 10:30. The all-female panel shared stories, including food solutions in tackling climate change. Other sessions continued the conversation about food, animal agriculture, climate change and their important relationship. 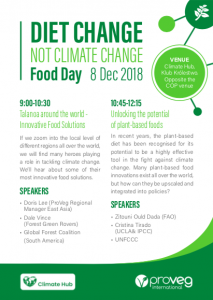 Lastly, we organized two Food and Climate Alliance (FCA) gatherings, the first occurring in week 1 on Saturday, 8th December at 2:00 PM in Meeting Room 18. 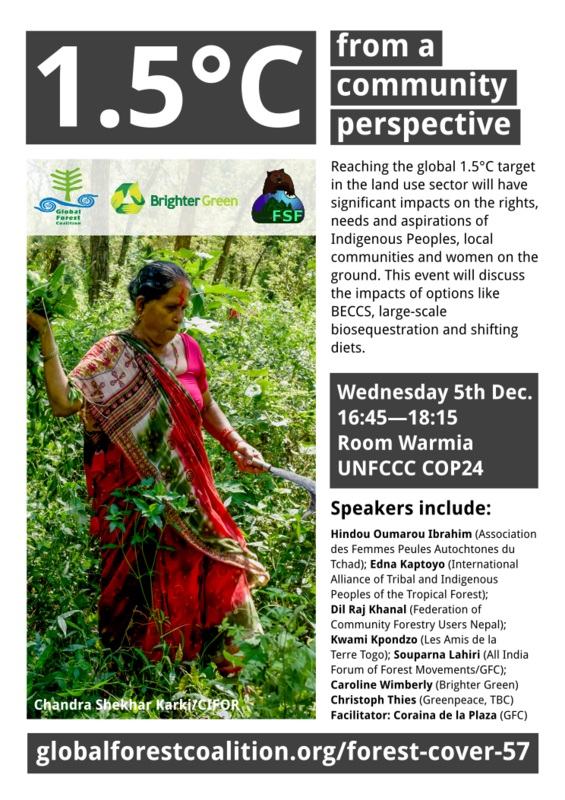 The second in week 2 on Thursday, 13th December at 2:30 PM on the 2nd floor of the Greenpeace Climate Hub. FCA envisions a future global food system that is healthy for people and the climate, providing a platform for communication and collaboration among non-governmental organizations to enhance civil society efforts that inform and influence agricultural climate policy at local, national, and global levels. Member include Brighter Green, ProVeg International, Johns Hopkins Center for a Livable Future, Center for Biological Diversity, Friends of the Earth, ClimateNexus, and Meatless Monday, among others.